Announced before Kina 2010, this new lens was eagerly awaited by photographers with Full Frame cameras who had to content themselves with the aged AF 35mm f2.0D for too long. Indeed, the cheap pretty good Nikon AF-S DX Nikkor 35mm f/1.8G is only suited for APS-C bodies. For this lens, Nikon uses a typical professional design with a weather-sealed magnesium alloy body, a Silent Wave Motor (SWM) for a quieter auto-focus and Nano-Crystal coating that Nikon uses to reduce the flare. In term of optical design, this lens is made up of 10 elements in seven groups, including one aspherical glass element. 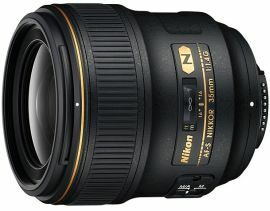 So, this wide-angle wide-aperture lens, which fits all Nikon cameras, is a good addition, but at $1797 it’s worth paying attention to its DxOMark measurements and compare it with its main competitors: the Nikon AF-S DX Nikkor 35mm f/1.8G and Sigma 30mm F1.4 EX DC HSM Nikon for APS-C, Carl Zeiss Distagon T 35mm f/2 ZF2 Nikon. The score map even indicates that this lens delivers very high quality for most apertures (from f/1.4 to f/5.6). Twice cheaper, the Carl Zeiss T 35mm f/2 ZF2 Nikon can be considered as a good alternative for photographer who are not bothered by manual focusing: the Carl Zeiss lens do not have an Autofocus.